Some of our amazing students doing their part in cleaning up our local beaches. Great job Gessica, Isabela, Katja, Liam and Helson! Congratulations to Diego. C from Chilie for winning the Lexis Noosa ping pong competition round 2 for November. Second place went to Jules from New Caledonia and third place went to Fabio from Switzerland. Great job to everyone who participated in this months ping pong competition. Hope you all had a great afternoon! Welcome to all the new smiling faces at Lexis Noosa. We have Jose Manuel, Julia and Carolina from Spain, Noriko, Yujio and Arisa from Japan, Stephanie, Jessica, Matthias, Sarah and Bryan from Switzerland, Jules from New Caledonia, Ragna from Germany and Yein from Korea. We hope you all have a wonderful first day at Lexis Noosa! We had such beautiful weather last Friday for our Noosa National Park walk. Happy Birthday Simara 🙂 We hope you enjoyed walking through the Noosa National Park! Thanks to all the students who came down to Lions park for the Pizza Party last night. It was a wonderful night to relax with friends, listen to music and have some pizza and drinks! Looking forward to seeing you at the next Student Night! Today we say farewell to our Cambridge classes as they are finishing their courses today and having their exams over the next week. Teacher: Kirsten, Students: Loane, Salome, Aline, Laura, Raphael and Robyn . Teacher: Phil Students: Mirjam, Carina, Sandra, Sophie, Michele, Marcelo, Chiara, Michelle, Christophe, Martina, Simone, Elvira and Jonas. Teacher: Anne Students: Luis, Lucas, Robin, Melanie, Sarina, Yobina, Sina, Jasmin, Elina, Soraya, Asier, Nico and Roman. Teacher: Marie Students: Lucas, Rodrigo, Carina, Claudia, Chantal, Katja, Viviane, Pascal, Manuel, Lea and Angela. Teacher: Kerri Students: Momoyo, Chiho, Matues, Sonia, Nikolai, Kotori, Lucie, Aurelie, Dominique, Jordan, Milena, Hana and Helson. Teacher: Michelle Students: Manuel, Saud, Sara, Fabio, Isabelle, Miya, Irene, Selina, Bettina, Isabela, Gesseca and Camila. Thank you for coming to Lexis Noosa! We hope you had a wonderful time with us and we wish you all the best in the future! It was such a crazy day with 60 students participating in our Aussie food tasting activity and 16 students competing in the ping pong comp! The Aussie food tasting was a huge success. The students got to taste musk sticks, macadamias, sausage rolls, Caramello Koalas, Lamingtons, Anzac Buscuits, tim tams and i’m sure you can guess all of the reactions to the horrid Vegemite! Congratulations to Lucas who came 1st in our ping pong competition and Patrick who came 2nd! Our general English courses are very communicative with a strong speaking and listening focus. The weekly grammar and vocabulary is practiced through activities, games, pair work and group work. However, writing is important also and we take it seriously. Not only is writing is a basic language skill but many students find that writing helps commit new language to memory. Postcards may be out of fashion, but emails and blogs and FB posts have taken their place. Students need to know how to write letters, reports and reply to advertisements. At Lexis, every general English student is given the opportunity to improve their English writing through the development of a writing portfolio. Writing is taught formally and explicitly and practiced through weekly writing tasks and assessed through formal weekly testing. The end result is a portfolio of writing examples across all genres to take home. Let me introduce Patrick. Here he is, towering above me in his classroom. Patrick arrived with minimal English. At the end of his first week he wrote the following for his teacher, Charmaine. Eight weeks later this is his writing. Congratulations Patrick on such a great improvement. Welcome to our 9 new students today at Lexis Noosa! We welcome Benjamin, Michaela, Flurina and Selina from Switzerland, Mami and Shinnosuke from Japan, Alejandro from Spain, Pasquale from Italy and Aneta from Slovakia. We hope that you all enjoy your first day :). Cambridge Speaking Exam – Done and Dusted! Cambridge exam candidates from our schools in Noosa and Maroochydore did their Speaking Exams on Saturday. Happy faces all around AFTER it was done! Waiting for their exams! And super happy faces afterwards! And a little encouragement for everyone from our wonderful CPE class with one week to go until the written exams: “Knock it out at the Ballpark”! Friday afternoon at Lexis Noosa calls for a cider tasting activity. The students get to taste 6 ciders from Australia and rate them according to the appearance, aroma, taste and palate. The ciders that the students get to taste are Somersby Pear Cider, Rekorderling Strawberry and Lime Cider, Matilda Bay Dirty Granny Apple Cider, 4 Seeds Bright Apple, Cheeky Rascal Passionfruit and Pink Lady Cider and lastly Pure Blonde Apple Cider. Hope you all had a great Friday afternoon! Lexis Noosa students had a wonderful afternoon painting boomerangs. The students were learning how to paint traditional and contemporary Aboriginal designs and symbols onto wooden boomerangs. We hope you all had a wonderful time this afternoon and can’t wait to see you on the next activity! Our Sunset classes enjoyed chocolate tasting as their morning activity on this fine Wednesday. The students got to try a plate of dark, white and milk chocolate. On the other plate there were 3 different flavours that the students needed to taste and figure out. They ended up being orange, mint and chilli flavoured. The students were to describe and rate each chocolate type as they were tasting. At the end the students indulged in a chocolate fondue fountain, enjoyed along with strawberries, banana bread and marshmallows. Jacqueline, Michelle, Nicole, Silvan, Caroline and Jan from Switzerland, Patricia, Lucas, Gabriela and Felipe from Brazil, Amaury and Solal from France and Sari from Japan. We hope you all have a wonderful first day and enjoy your time here at Lexis Noosa! Lexis Noosa students spent the afternoon trying some delicious cider from all over the world. Somersby Pear Cider is a refreshing and crisp cider made from fermented pear juice and natural pear flavouring. There are no artificial sweeteners, flavours or colourings added and it’s sparkling and refreshing nature makes it a perfect addition to any Sunday afternoon. Made from the purest Swedish spring water and deliciously ripe summer strawberry flavours, Rekorderlig Strawberry & Lime Cider is perfect served over ice or mixed with fresh mint for an incredible taste sensation. Dirty Granny Matured Apple Cider is the new Apple Cider from Matilda Bay! Classic and craft in style, Dirty Granny has a rich and full flavour which combines a good balance of sweetness and acidity and the crisp, refreshing taste of 100% Australian apples. 5 Seeds Bright Apple is a refreshing cider with the naturally sweet taste of Gala apples. A sweeter tasting apple cider that’s easy-drinking with a clean finish. We’ve crafted this cider to hit the perfect sweet-spot. With the addition of a new variety of naturally sweet gala apples, this is a thirst quencher with a sunny golden colour and smooth, clean finish. Refreshingly different! Lovers of Cheeky Rascal’s refreshing fruit-flavoured ciders are going to fall head over heels for their Passionfruit and Pink Lady Apply cider blend. Power packed tropical flavours courtesy of quality Passionfruit is expertly intertwined with crunchy Pink Lady characters to create a cider destined for a Sunday afternoon. Our FCE 1 class worked hard in their FCE speaking exam workshop this afternoon! Great job everyone. 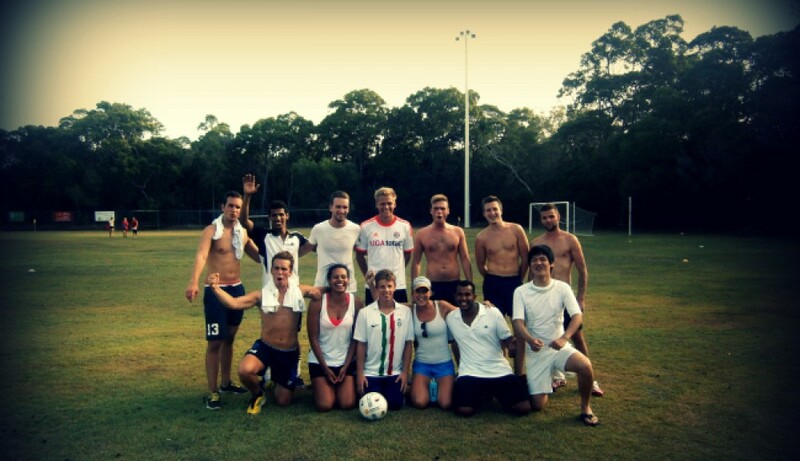 This afternoon Lexis Noosa students made their way down to Noosa Main Beach where they enjoyed a game of beach soccer. After a few days of unwelcome rain everyone was super excited to get down to the beach. What a lovely afternoon it turned out to be. The sun even started shinning! A very warm welcome to the 23 new students at Lexis Noosa this morning. We have 15 students from Switzerland, 2 students from Japan, 2 students from Brazil and 4 students from Brazil. We hope that you all enjoy your first day at Lexis and have a great time while you are here in Noosa! Have a look and see what the Lexis Noosa students will be doing next week after school! Anyone wanting to play beach soccer or climb Mount Coolum? Wednesday afternoon is the day for you! Sign up at reception to reserve your spot. Lexis Noosa students will be meeting up at KB’s for Glow Party at 9pm! KB’s provides a perfect atmosphere for student night. Loud music, amazing drinks and plenty of dancing. Sign up at reception! Anyone wanting to try some cider from around Australia? Friday afternoon is the day for you! Sign up at reception to reserve your spot only 30 available! Sounds like a perfect week of activities to me! Surfing has been so popular lately that we just had to do another lesson! This afternoon the students at Lexis Noosa practiced their surf skills while they got to enjoy the refreshing water. What could be better then an afternoon at the beach!